An Outlook data file can grow quite large over time. And it’s never easy for Outlook users to work with large files. An oversized PST file can cause serious issues like performance degradation and mailbox corruption. In this article, you’ll learn how to compact PST file size by using the built-in Import feature of Microsoft Outlook. For instant and better results, you should use a professional PST Compress tool. With continuous incoming and outgoing of email messages, the PST file size gradually increases over a period of time. Microsoft Outlook creates an Outlook data file to store all your emails, contacts, calendar entries, tasks, appointments, notes, as well the attachments. The more emails you’ll send and receive, the larger your Outlook mailbox will grow. And one day, the mailbox will reach its maximum size. Some Outlook users ain’t aware of the actual problems which usually occur due to a large mailbox size. A large PST file takes a significant amount of space on the computer’s hard disk drive. And sometimes it may happen that you need to buy an additional hard disk to store a large number of PST files. An oversized PST file can cause serious performance issues in the Outlook client. And the worst impact is corruption which may happen when a PST file reaches or crosses the maximum size limit. In such a situation, you must repair PST file to save your crucial mailbox from being lost. Are you aware of the PST file size limit? Microsoft Outlook saves the Outlook data file (.pst) in two different formats: ANSI and Unicode. The ANSI PST file created by Outlook 2002 and earlier versions, can store the mailbox data up to 2 GB. On the other hand, the Unicode PST file is created by Outlook 2003 and later versions including the latest 2016. It has the maximum size limit of 20 GB to 50 GB. Remember, a PST file can only store the mailbox data up to its maximum size limit. Make sure the PST file never crosses its maximum size limit. Even it should never reach close to it. Because whenever it happens, you’re likely to face severe issues. The file xxxx.pst has reached its maximum size. To reduce the amount of data in this file, select some items that you no longer need, then permanently (shift + del) delete them. 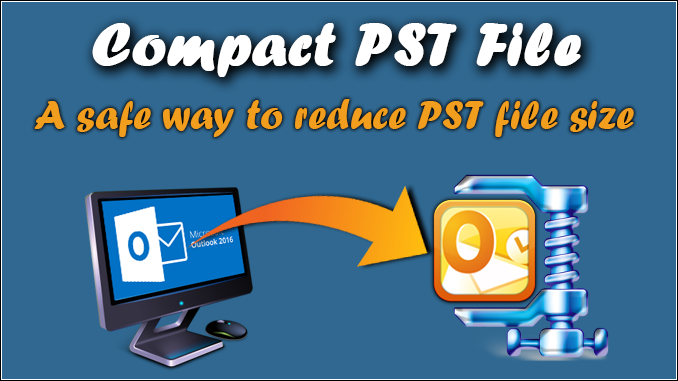 Generally, Outlook users resolve the problem of an oversized PST file by deleting a few unwanted email items. Remember, whatever you delete goes to the “Deleted Items” folder. This feature is extremely helpful when you delete something by an accident. You can restore almost everything whatever you delete from the deleted items. But if you want to delete the email items permanently, you must empty the deleted items folder. But even that doesn’t help you here. Although the deleted items are no longer visible in the PST file, they’re still taking the same amount of space what they were taking previously. It’s commonly known as “white space” or “empty space” in an Outlook data file. As a result, the PST file size remains the same as it was earlier. And this unused space can turn into a significant portion of the total size of the PST file over time. The best way to deal with an oversized PST file is to remove all the unused space from it. 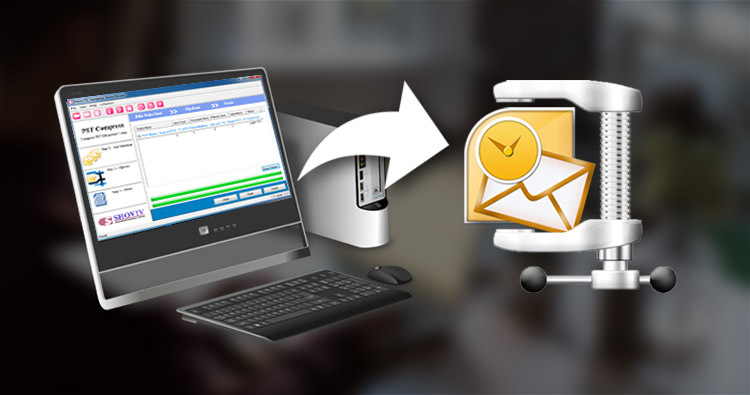 In this way, you can successfully reduce PST file size and increase the Outlook performance. How to Compact PST File? First, launch Microsoft Outlook on your computer. On the taskbar, click the File tab > Info. Click the Cleanup Tools tab next to Mailbox Cleanup. Select Mailbox Cleanup… in the options. On the Mailbox Cleanup dialog box, click the View Mailbox Size… button in order to view the total size of your Outlook mailbox. On the taskbar, click the File tab > Info > Account Settings. On the Account Settings dialog box, click the Data Files tab and select the Outlook data file you want to compact. Now click Settings. On the Outlook Data File dialog box, click the Compact Now button to compact PST file. Microsoft Outlook will start compacting the PST file size. It may take some time. Once the process will be successfully completed, you can check the PST file size. Remember, before you can compact PST file size, make sure you’ve deleted all the unwanted emails and other items. Before purchasing the full version of PST Compress tool, you must download the demo version for free evaluation. By using the demo version, you can save first 25 email items from each mailbox folders of the selected PST file(s). And if you’re satisfied with the results, then only you should purchase the software. An oversized PST file can cause serious troubles for Outlook users. It not only causes Outlook performance issues but also mailbox corruption which may lead to data loss situation. In this article, we’ve learned how to reduce PST file size to make it handy and easily manageable. To compact PST file, you can use the built-in Compact feature of the Outlook client. Also, you can use Shoviv PST Compress tool, a professional solution for better results.